Apple deals continue to heat up this September, with record low prices on Mid 2017 systems. Snap up a 13″ MacBook Pro with Touch Bar for $ 1,399 after a $ 400 cash rebate. Apple’s current MacBook Air is also on sale for $ 799 ($ 200 off), while loaded 15″ MacBook Pros are up to $ 800 off with no tax collected in most states. 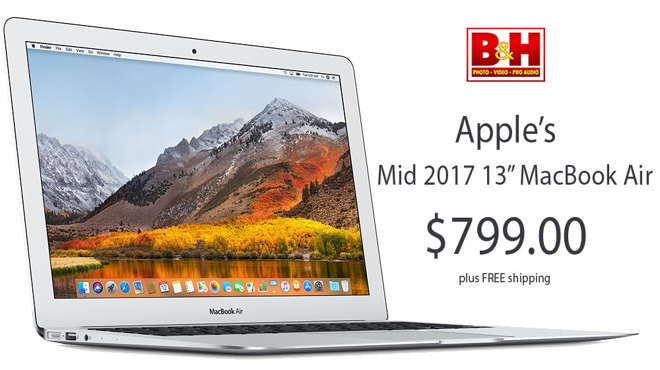 In what is a record breaking discount, Apple authorized reseller B&H Photo is slashing the price of the 2017 13-inch MacBook Pro with Touch Bar by $ 400, bringing the price of the Silver model down to $ 1,399.00. 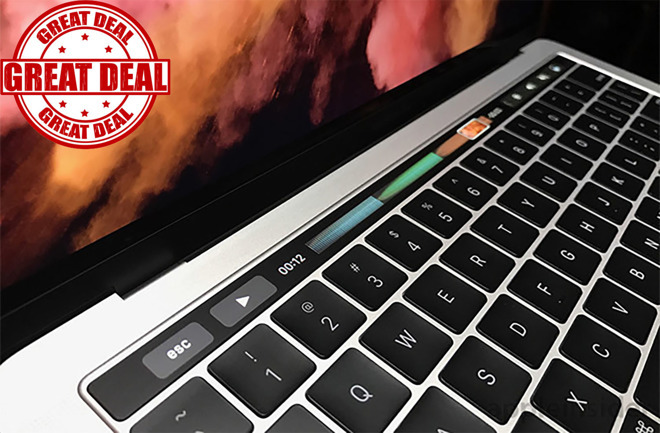 This special offer rings in as the lowest price available for the 3.1GHz, 8GB, 256GB model by at least $ 200, according to our 2017 13-inch MacBook Pro with Touch Bar Price Guide. In addition to the cash savings, B&H also will not collect sales tax on orders shipped outside New York and New Jersey*, saving many shoppers another $ 110 on average. You won’t have to wait long to get up and running either, as this model also qualifies for free expedited shipping within the contiguous U.S. Please note: B&H will be closed Sept. 18 through Sept. 19, so orders placed after Monday’s cut-off time will go out on Sept. 20. You can easily tack on an AppleCare extended protection plan to these 13″ MacBook Pros for $ 269 by selecting the AppleCare option immediately after you press the “Add to Cart” button on B&H’s website. Apple’s high-end Mid 2017 15-inch MacBook Pro is also marked down at B&H Photo with a record low price of $ 1,999.00. This upgraded config in Silver boasts a faster 2.9GHz processor, 512GB of storage space and top-of-the-line Radeon 560 4GB GDDR5 graphics. This deal, which knocks $ 800 off off MSRP, provides shoppers with the lowest price available by at least $ 450. In addition to the instant cash discount, B&H is throwing in free expedited shipping within the contiguous U.S. to get you up and running in a matter of days. B&H also will not collect sales tax on orders shipped outside New York and New Jersey*, saving many shoppers another $ 160 on average. To compare this config to a similarly equipped 2018 model, you would need to spend at least $ 500 more. Like the systems above, each MacBook Pro is brand-new and factory sealed, with the ability to add AppleCare+ to your purchase in your cart on B&H’s website. For even more closeout deals, see below and our Mid 2017 15-inch MacBook Pro Price Guide. ($ 500 off + no tax outside NY & NJ*) – Hot deal! You can easily tack on an AppleCare extended protection plan to these 15″ MacBook Pros with Touch Bar for $ 379 by selecting the AppleCare option immediately after you press the “Add to Cart” button on B&H’s website. Shoppers can also take advantage of triple digit discounts on Apple’s current 13-inch MacBook Air. The base model starts at just $ 799.00 after a $ 200 cash discount, with upgraded models hundreds off as well. According to our 2017 13-inch MacBook Air Price Guide, these deals offer shoppers the lowest entry price into a MacBook period and beat competitor prices by at least $ 80. Like the Touch Bar bargains highlighted above, B&H will not collect sales tax on MacBook Airs shipped outside New York and New Jersey*, saving many shoppers outside those two states $ 210 to $ 280 on average compared to buying from the Apple Store. And these are the same factory sealed systems you would get from Apple, only cheaper. Shipping is also free within the contiguous U.S. for fast and easy delivery to your door. You can easily add on an AppleCare extended protection plan to these 13-inch MacBook Airs for $ 249 by selecting the AppleCare option immediately after you press the “Add to Cart” button on B&H’s website. See if there is a Mac, iPad, Apple Watch or Certified Used iPhone deal that will save you $ 100s by checking out prices.appleinsider.com and deals.appleinsider.com.